Mix the garlic and steak seasoning in with the ground beef to distribute evenly. Divide ground beef into 8 even sections and shape into quarter-pound patties; set aside. Preheat the grill. Clean the peppers and slice as desired. Place patties on the preheated grill and season with salt and pepper to taste. Cook on one side until nicely charred. Flip and cook to desired doneness. 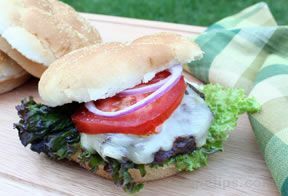 Spread butter on the hamburger buns and toast on the grill or in a pan on the stovetops. 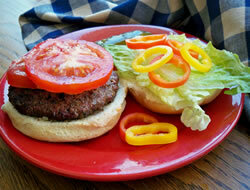 Place one burger on a toasted bun and add sweet peppers according to taste. Add onions, tomatoes, lettuce and other condiments as desired. 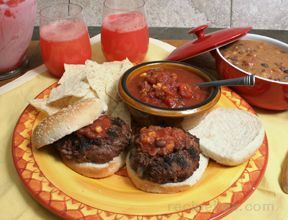 "I had friends over for a cookout and I furnished the burgers. I made these and supplied all the fixings. No one had tried sweet peppers on their burgers before. We all liked the great flavor that they added. 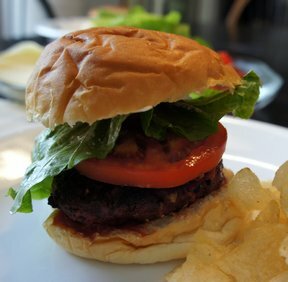 These burgers were a hit. I will definitely make them again."